Note: This kit includes resonators for a quieter exhaust tone. 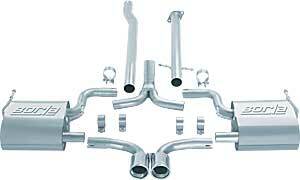 Millions of exhaust systems are replaced every year due to corrosion and poor performance. Automotive exhaust gases attack from the inside out while vibration, chemicals, road salt, and other harsh conditions attack from the outside. When you consider what an exhaust endures, it's easy to see why your vehicle needs a Borla stainless steel system. Borla builds their cat back exhaust systems from 100% T-304 aircraft-quality stainless steel, which maintains true form and functions at all points for superior corrosion protection. Borla's world-class quality and performance capability are considered by many to be a very worthwhile investment, and Borla's One Million Mile Warranty proves they believe in their products.